An industrial automation manufacturing company located in Grass Valley, California, needed to create and design a working communication system to connect multiple devices on auto-guided machines. Ward Systems Inc., designs manufactures and distributes automated pallet handlers used in warehouse and industrial settings. In order for the handlers to be automatically guided through a warehouse with precision, cameras attached to the vehicle itself must be as accurate as possible. These cameras also need to interact with a PLC running Modbus TCP/IP, which writes and ready data to and from the cameras’ power for efficient battery usage. As shown to the right, five cameras needed to communicate with a PLC on each handler. Ward Systems decided to use Comtrol’s DeviceMaster® UP 4-Port and a daisy-chained DeviceMaster UP 1-Port to provide support for each camera. 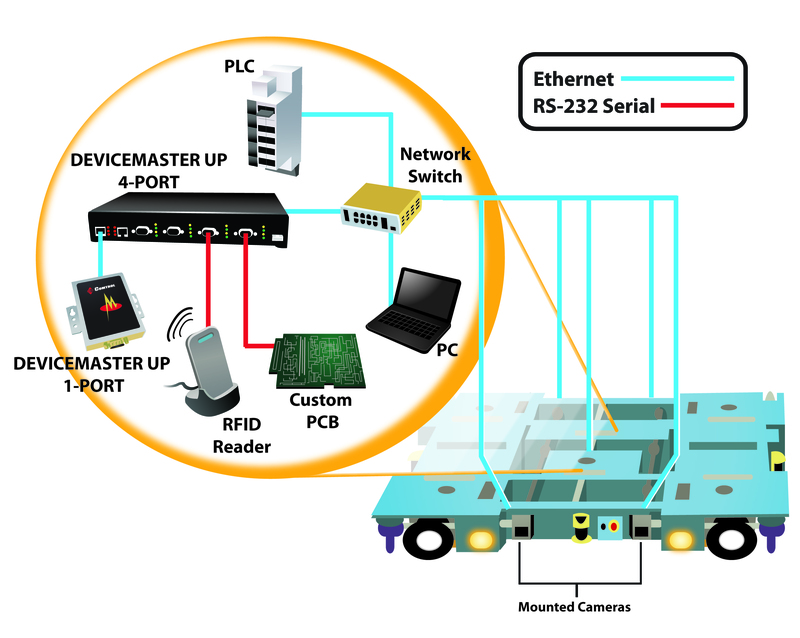 All of the cameras are directly connected to one network switch, which is then connected to the DeviceMaster switch, which is then connected to the DeviceMaster UP 4-Port and DeviceMaster UP 1-Port. The PLC is also connected to the network switch, along with a detachable PC used for configuration and programming. An RFID reader and a custom PCB board connect to the two remaining ports on the DeviceMaster UP 4-Port. The cameras on the pallet handlers support raw/ASCII data, while the PLC supports Modbus TCP/IP. Comtrol’s DeviceMaster UP enables communication between the two different protocols to make the entire system a success.